I hope you all enjoyed Mother’s Day! What did you do? Papa Bird makes a great breakfast. But with our new house still filled with boxes, I thought going out would be more relaxing. 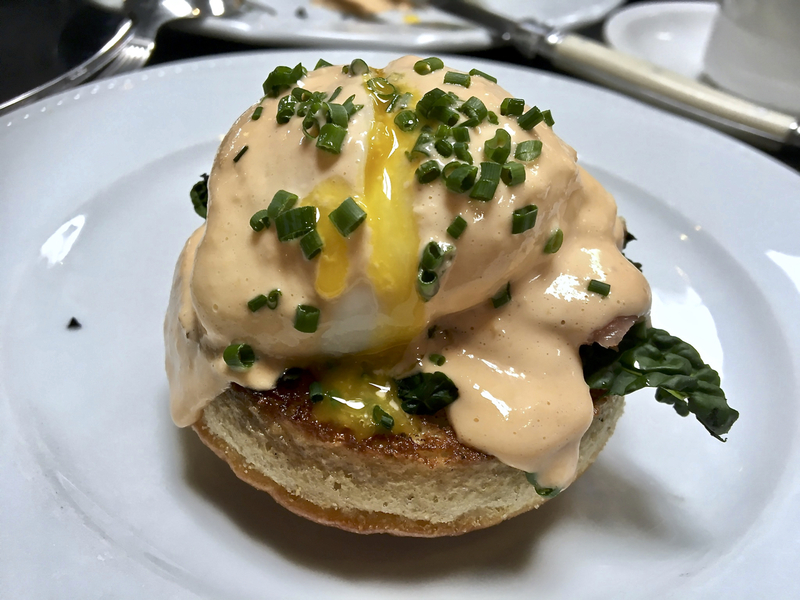 So we had a delicious brunch at Herb & Wood in Little Italy. 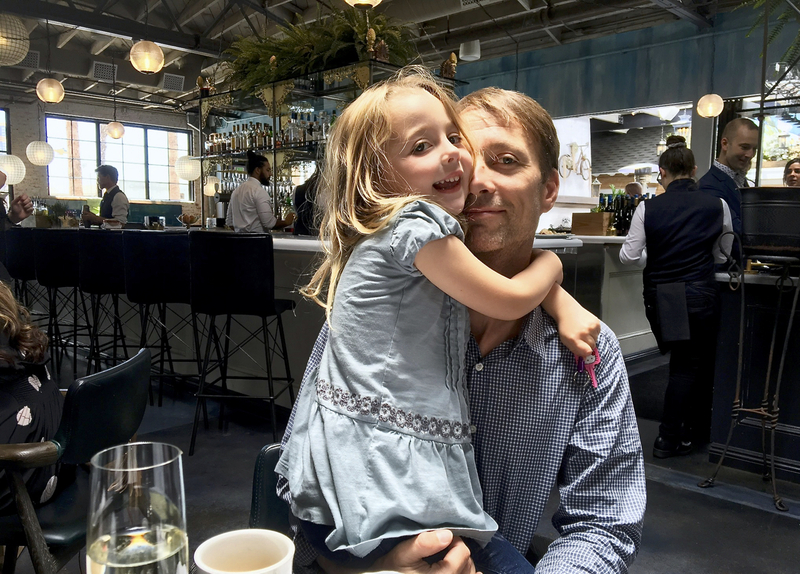 If you follow our family on Instagram, you will know we often eat breakfast at Herb & Eatery, which is the casual market/cafe side of Herb & Wood. Papa Bird and I have had the pleasure of a night out at Herb & Wood, but we’ve never gone to brunch. In fact, they just started serving brunch last month! We love the croissants and pastries at both places. In fact, their pastry chef, Adrian Mendoza, is currently my favorite in town. Stand-outs for us were definitely the sweets. 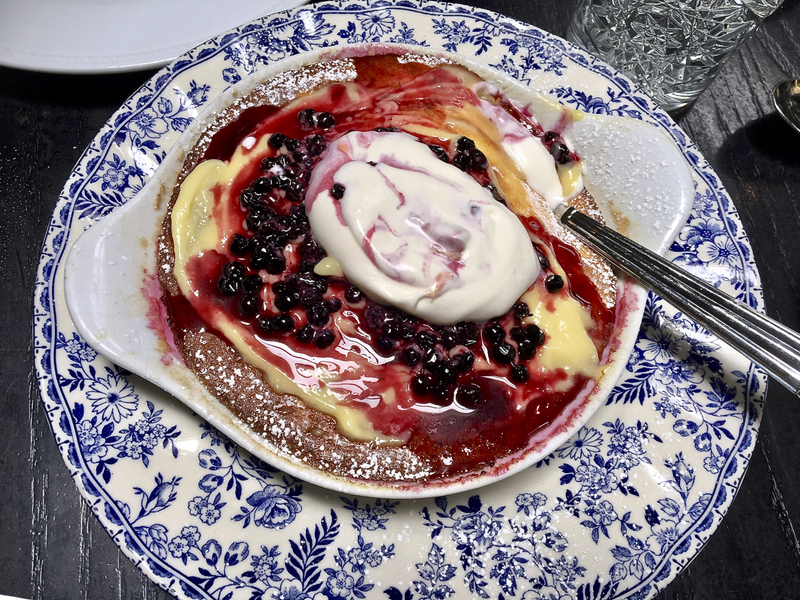 We would 100% order the Dutch Baby Soufflé Pancake again. The table side presentation includes topping it, fresh from the oven, with huckleberries, lemon curd, and chantilly cream. 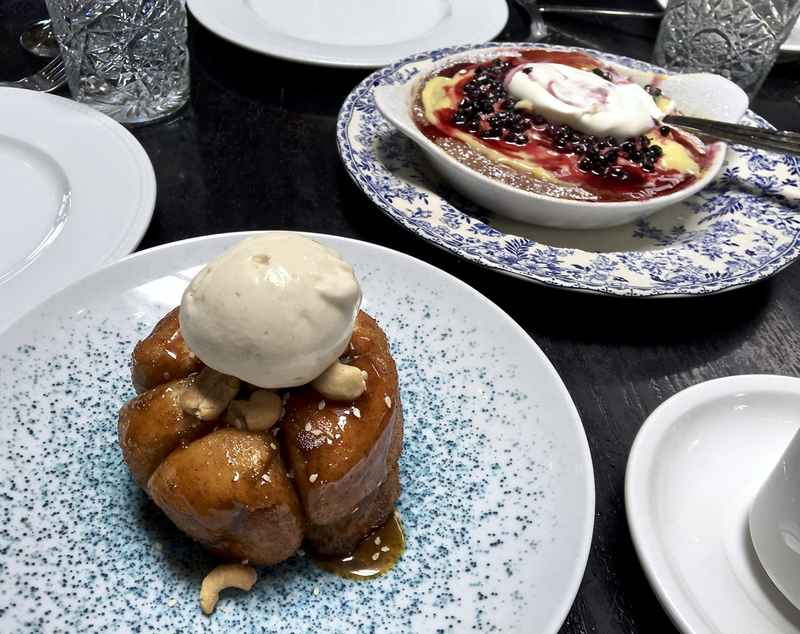 I’d say we would order the Monkey Bread with caramel, sesame seeds, cashews and tahini gelato again…. but we already did! It was my choice to start us off and Papa Bird ordered a second round for us to finish our meal. It’s a definite winner — and tip, only limited quantities are made each weekend, so order early. If the place weren’t so fancy, I would’ve definitely licked the plate. 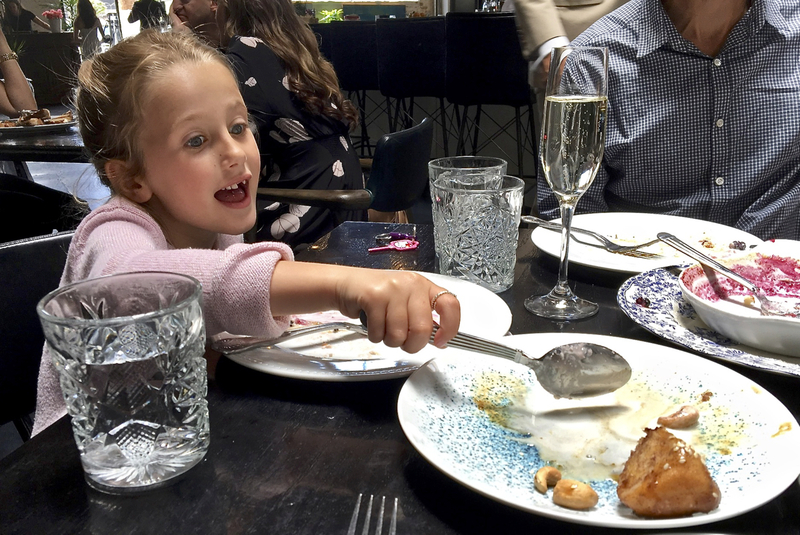 To be honest, I thought we ordered a lot of food, between the French Onion Omelet, the Jamon Iberico Benedict, an Avocado and Burrata salad, and all the sweets. However, after leaving, I realized we never got to try their breakfast or brunch pizzas. You can see the current brunch menu here. In addition to the attentive service, they went above and beyond with extra touches for Mother’s Day. 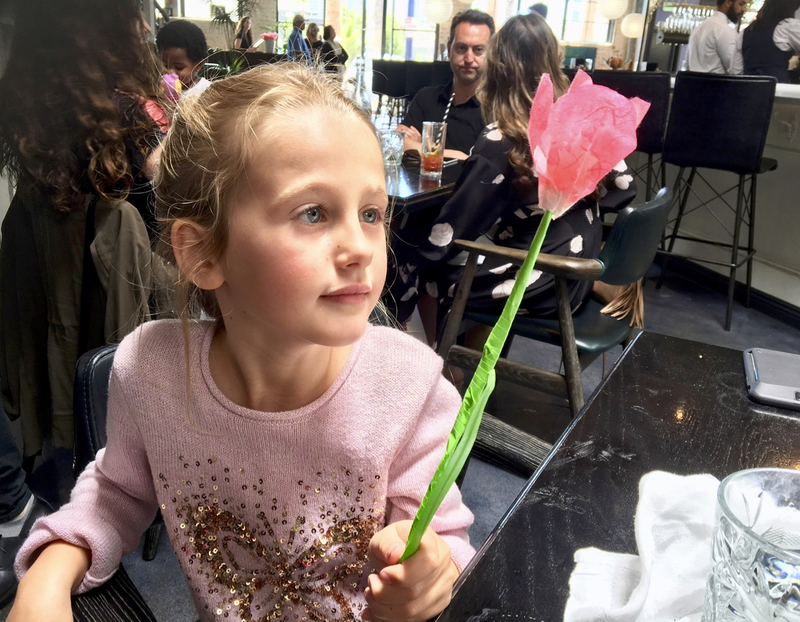 Our friend Nikki, who we know from frequenting the market side, made dozens and dozens of paper tulips to give to all the mamas. Our server delivered the flower at the end of the meal with a pair of perfect macarons packaged to take home. 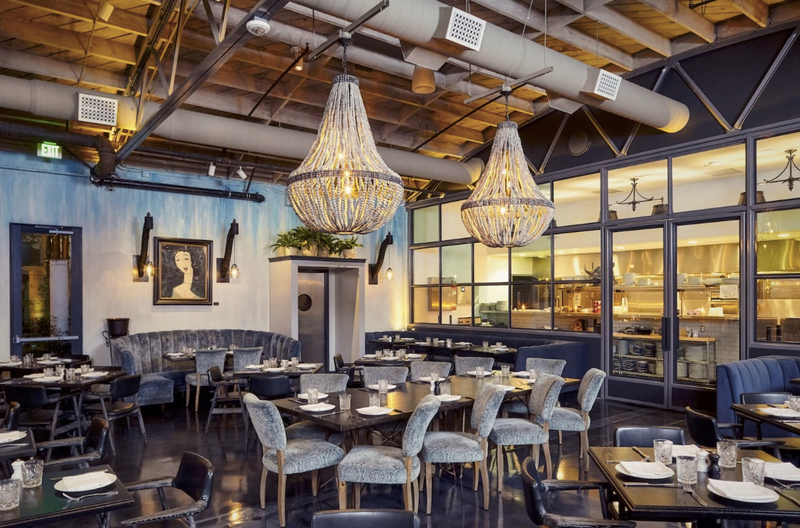 Since brunch service is still new, reservations are a must. But if you do procrastinate, you’ll have the best luck finding a table when they first open at 10am. Parking is really not that bad on Sundays and the meters are free. Dress to impress. 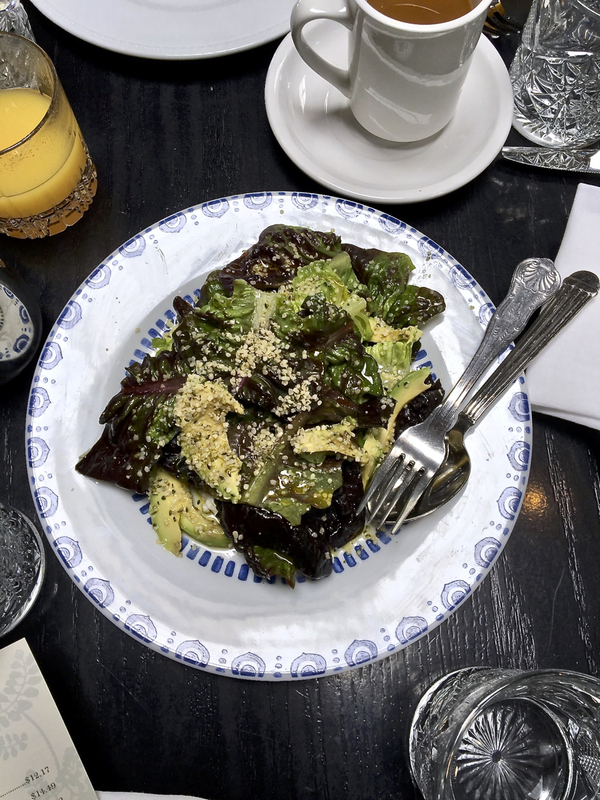 Even brunch is a scene to be seen. I would say rock your own style, whatever you feel that is, but don’t phone it in. You don’t want to get there and feel underdressed. 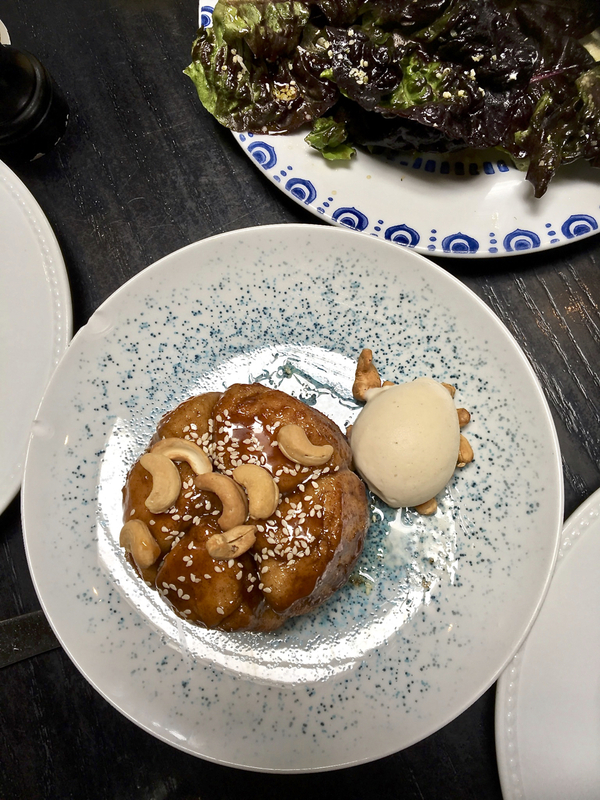 Only limited quantities of the Monkey Bread and Pastry Basket are baked each day, so put those orders in early. The orange juice is freshly squeezed – ambrosia, as my dad used to call it. Why, hello! Happy 2018. It’s been a minute. Did you know that honey is not only a delicious treat? A raw honey face mask is an easy, affordable way to leave your skin radiant and pores refined, without any unwanted additives. Look! Me with no makeup. It turns out, honey is not just good for baking! We give the Little Birds honey when they have a cough or sore throat. I’ve long known about it’s antibacterial properties and heard it’s good for skin. A friend uses raw honey as a face wash. This week, I was taking a close look at my pores, and figured honey couldn’t hurt. I also tend to have red patches on my skin. The lady I see for facials thought my skin could be sensitive to seasonal allergies. Which made me think of how local pollen, or honey such as San Diego Honey’s Pollen Plus, soothes seasonal allergies. Why not applied topically? Over just washed, clean skin, I took a little raw honey and simply spread it over my face with my fingers, focusing on the T-zone, and avoiding my hair line. My skin had a radiant glow, as though glowing from within, but not looking shiny or oily. I should add that I am not wearing any makeup on my skin in the “after” photo. To be honest, I may have cheated a little bit with my eyebrows. If you look at the before photo, you’ll see why! (For those that are curious, I’m wearing Benefit’s Ka Brow in shade #3.) But honest to goodness, no foundation, tinted moisturizer, or concealer (nor photo-retouching) — I wanted to show off how nice the honey left my complexion. Personally, I picked Buckwheat Blossom Honey as it has an extra high level of antioxidants and is known for its health benefits. Other good choices include the hyperlocal Coastal Wildflower or the Pollen Plus. A citrus infused or the ginger lemon honey might make an interesting honey face mask, too. Have you ever used honey as skincare? Want to try it? Pin this article to save it for later! Any time you cook with kids expect a mess. Multiple your prep time by three. Your results may not be as pretty or as perfect. Then again, kids cooking means kids more likely to try new food, having fun/bonding, and absorbing math and science! Would you like to see our last project? We made homemade almond milk. And with the unanticipated byproduct of leftover almond pulp, the kids made the most delicious almond granola — too tasty not to share. When the girls and I decided to try making almond milk at home, we picked up raw almonds at Specialty Produce. After soaking for a day, we ground the almonds in a Vitamix and strained it through cheesecloth leftover from my cheese-making days. If you are serious, you can buy a nut milk bag. If you just want to experiment, you can even use an old pillowcase or dishtowel to strain. It tastes really grainy if you don’t strain. But if you would like to try a nut milk that doesn’t need to be strained, I recommend cashews, like this raw cashew “horchata” recipe. 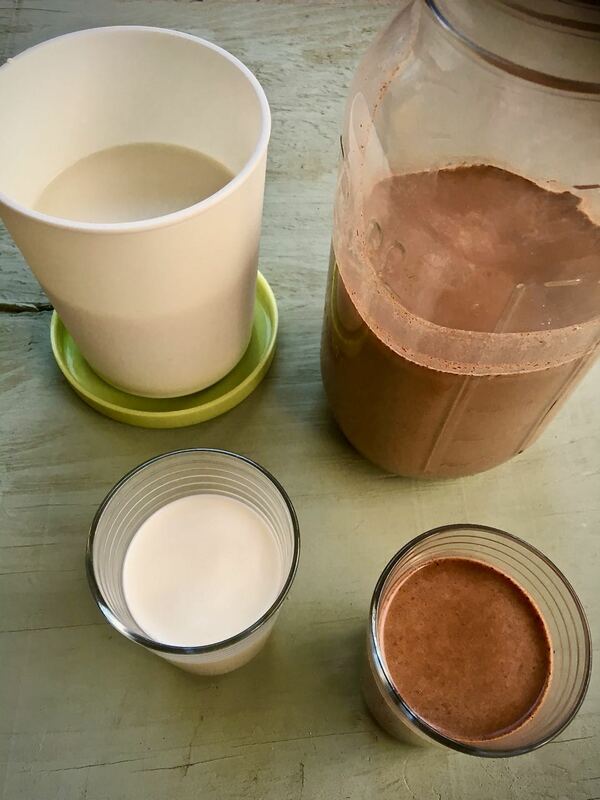 We made a batch of vanilla bean honey almond milk (sweetened with the vanilla bean honey from San Diego Honey Company) and a dark chocolate almond milk. The basic vanilla recipe I found here and would make again. The chocolate recipe used melted chocolate, and wasn’t as smooth as I would’ve liked. Next time I’ll try raw cacao instead. Straining the almond milk through the cheesecloth reminded me so much of making cheese back in the day! It’s been nearly five years since I posted this step-by-step pictures guide to making fresh goat cheese (chèvre) – one of my most comprehensive posts ever. Little Bird used to help add the chèvre culture and roll the logs before she was even two. Leftover Almond Pulp Makes Great Granola! We ate a bunch of the almond pulp – which really needs salt – as a snack. I thought it could be interesting as a vegan stuffed pasta filling. Not to mention, it’s a fresher version of the almond meal I buy for baking. However our winning idea was granola! The girls had fun spreading out the almond pulp on a baking sheet to dry it out. Use your hands! 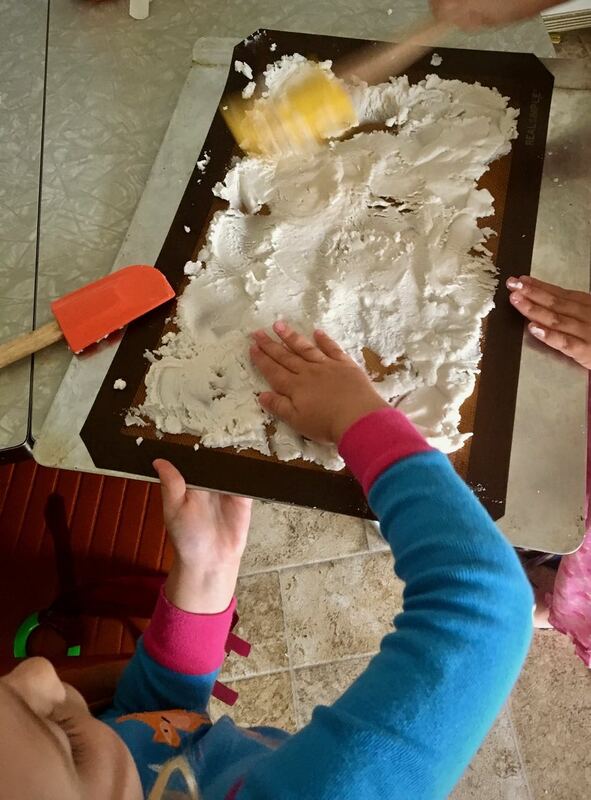 Such good sensory fun and… it totally feels like kinetic sand! Seriously, you have to try it. You dry out the pulp in a 200° oven for a few hours, checking it and stirring and breaking it up once an hour. You want the moisture mostly gone. A little browning is fine, but don’t burn any of it. The result is “healthy looking” aka kind of a bland, crunchy thing. 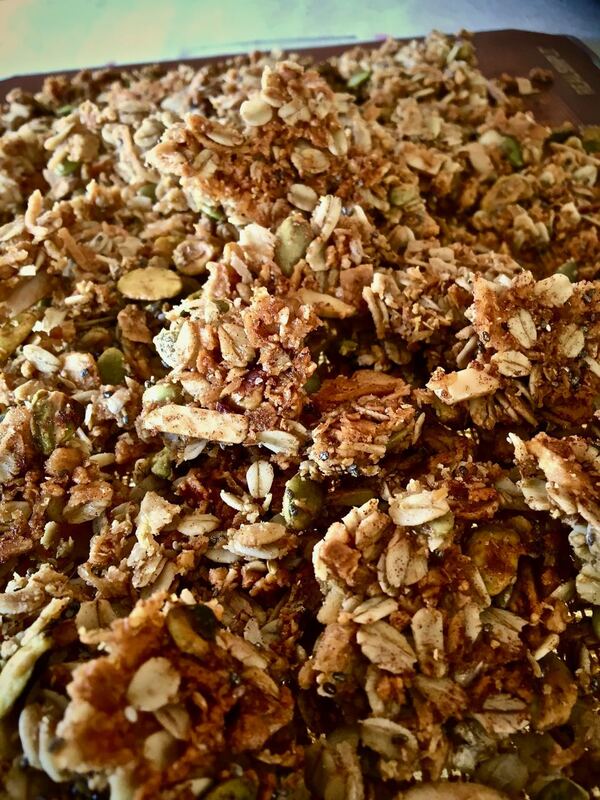 But once you add all the good stuff, it blends right into the granola, giving it extra body. Please improvise with your favorite ingredients. We threw in whatever nuts we had in the freezer! Have fun with it. Don't throw away the leftover almond pulp when you make homemade almond milk! It gives body to the most delicious granola. 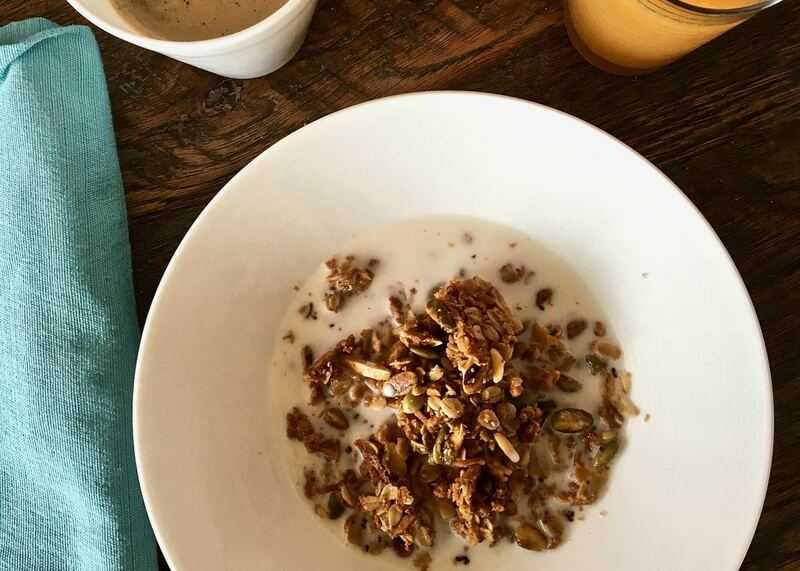 Not to mention, the granola and homemade almond milk taste amazeballs served together! First, if using leftover almond pulp from making almond milk, spread out the pulp in a thin, even layer on a baking sheet lined with a silicone mat or parchment paper. Bake in a 200* oven. Check it after two hours, breaking up, stirring and flipping the pulp. Bake for another 1 to 2 hours, checking and stirring periodically, until mostly dried. Next, allow the almond meal to cool, then add it and all of the rest of the ingredients to a medium-sized mixing bowl and stir. Finally, spread the mixture in an even layer on a baking sheet lined with a silicone mat or parchment paper. This time bake at 275* for 15-25 minutes, or until lightly brown and toasted. Let cool. IMPORTANT: Don't mess with it or break apart the giant granola bar until it has cooled for one hour. Then break it up into big chunks and store in an air-tight container. 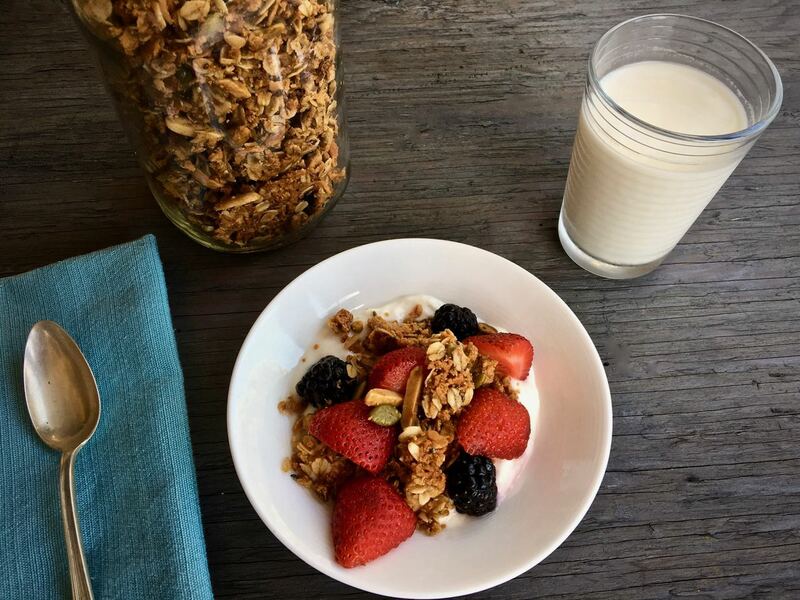 Have you ever made homemade almond milk or granola?